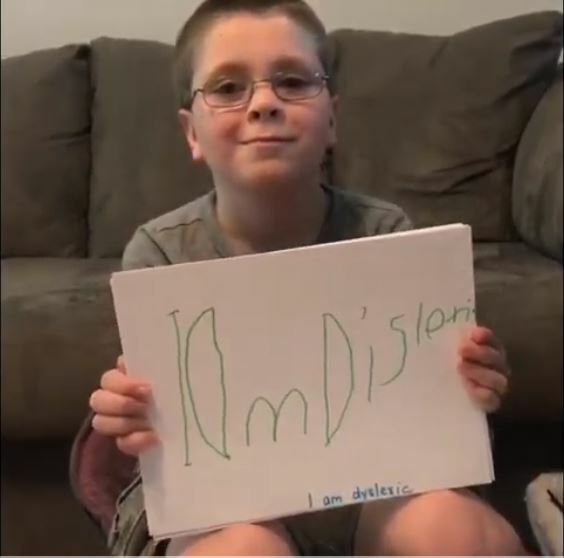 Riley Reese, shared this video of her son, Ethan, to explain his battle with Dyslexia and to help spread awareness. The video was actually done as part of a community awareness project on dyslexia that her daughter is doing for HOSA. Their project's goal was to bring attention to students that have dyslexia and to get them the chance to learn like everyone else. Without help, children often find other coping mechanisms. They wanted to reach parents and teachers mainly, so they can help their children overcome this learning disability. Ethan was almost 7 when he was diagnosed with dyslexia. He struggled all through kindergarten and left kindergarten basically unable to read. Ethan is currently in 4th grade. After 3 years of tutoring, he reads at grade level but still cannot spell. Ethan currently attends an IEP for dysgraphia and dyslexia. He uses an iPad at school a lot of the time so that he doesn’t have to write everything out. Ethan says that dyslexia is just another thing that makes him special! Dyslexia is not an ugly word. It helps to have extra time on a test and a copy of the notes. Not all dyslexics have the same struggles.